That gory incident took place on 16 July 2004 in a Middle School around 10 am when the noon meal was being prepared in the school kitchen that had a thatched roof. The roof caught fire when a spark from the burning firewood fell on it and spread to the thatched roof of the classroom where several children were studying ! – sure you have read those details and sadness. 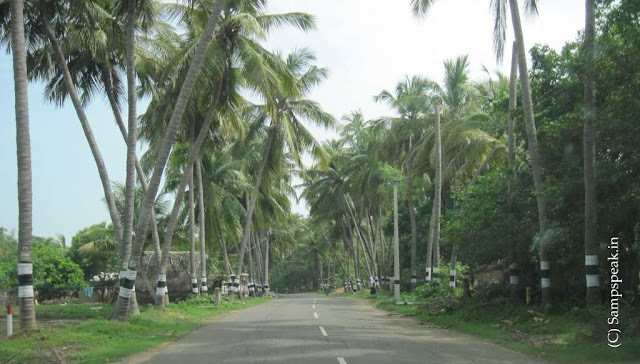 Kumbakonam, is located 40 km (25 mi) from Thanjavur and 273 km (170 mi) from Chennai. The town is bounded by two rivers, the Kaveri River to the north and Arasalar River to the south. Kumbakonam is known as a "temple town" due to the prevalence of a number of temples here and is noted for its Mahamaham festival which attracts people from all over the globe. Kumbakonam dates back to the Sangam period and was ruled by the Early Cholas, Pallavas, Medieval Cholas, Later Cholas, Pandyas, the Vijayanagar Empire, Madurai Nayaks, Thanjavur Nayaks and the Thanjavur Marathas. It rose to be a prominent city between the 7th and 9th centuries AD, when it served as a capital of the Medieval Cholas. That sad and infamy of 2004 fire in a middle school reportedly killed 94 students of primary section and brought to fore the unsafe conditions in which some schools had been functioning. A committee setup under a retired Judge found out that the heavy casualty was the false tactics of the management to bring the other two school students to the aided primary school to mislead the inspecting authorities about the student-teacher ratio. The Chief Minister who visited the site, ordered the withdrawal of the recognition of the three schools, prosecution of the school authorities and the correspondent, suspension of the Chief Educational Officer, the District Elementary Educational Officer and the Assistant Elementary Educational Officer of Thanjavur school district. A compensation of ₹ one lakh was provided to the kins of the victims, ₹25,000 to the severely injured and ₹ 10,000 to other injured from the Chief Minister’s Public Relief Fund. The trial of the case started after a long delay in Sept 2012 in the Thanjavur district sessions court. The case had 21 accused and had 488 witnesses that included 18 children affected in the accident. Thanjavur district sessions court sentenced school founder to life imprisonment and fined ₹ 51,65,700. Ten others including school staff and officials from the Kumbakonam municipality and education department of the state were sentenced to five year imprisonment. Eleven accused, including three teachers were released from the case. The families of the 49 children killed in the 2004 Kumbakonam school fire tragedy have approached the Madras high court alleging that their counsel had withdrawn ₹2.30 lakh each — amounting to nearly ₹1.12 crore — from the compensation given to them by the state government. Admitting the pleas, a division bench of justices R Mahadevan and V Parthiban warned the advocate, S Tamilarasan, of dire consequences and suggested that he repay the money to the victims before it passed an order. The court then posted the matter for hearing on April 9. According to U Marimuthu, one of the petitioners, after a delay of nearly 10 years by the state, the HC ordered the government to award compensation ranging from ₹5 lakh to ₹8 lakh to the parents of the victims along with interest. On December 21, 2016, the compensation was deposited in Marimuthu’s bank account. But a few weeks ago, advocate S Tamilarasan, who represented them in the high court, came to Kumbakonam and summoned all the parents. He obtained two undated blank cheques and signed blank papers from each of the claimants. Thereafter, to his shock and surprise Marimuthu received a message from the bank on December 22 saying that ₹2.30 lakh had been deducted from his account. He rushed to the bank and found to his dismay that counsel had misused the blank cheques and diverted the money in his name and in the names of other such victims. Claiming that the act of the advocate was illegal, high-handed, fraudulent and breach of the trust of the claimants, the petitioner said each of the claimants had already paid ₹3,500 towards his professional fees totalling to ₹3.5 lakh. How sad ! !